To say we are excited to add this young doe to our herd is an understatement! 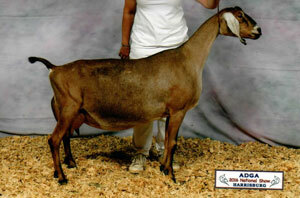 She is linebred on a remarkable doe, who has proven herself in the show ring, the milk pail, and as a brood doe! GCH Scotchbriar Wild Joy is the 2016 Reserve National Champion, and is a lovely doe! She has produced several beautiful daughters who in their turn have also produced numerous sons and daughters who have represented the nubian breed well! Legacy's dam, Merriment has been slow to mature, but the wait has been worth it! 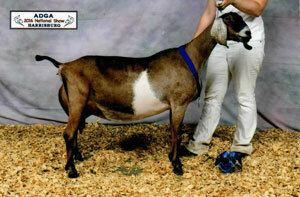 As if the linebreeding on Joy was not enough, Legacy's paternal grandsire is son of the 2012 National Champion, Sasha! Legacy herself shows tremendous width and dairyness, she has beautiful brown ears(The only ones in our barn!) and we are very excited to watch her mature!